Performing to an audience 9000 miles away with at Priesthorpe School, Leeds! Our African Drumming workshop last week at Priesthorpe School in Leeds had a fabulous spin to the day with the help of some useful phone technology.The class in period two gave a performance to a particularly remote audience. The day kicked off with a brilliant group of Y9 teenagers. we had never come across a nicer and friendlier Y9 class - yes- really! - and we're not just talking about good and well behaved. Sometimes 'well behaved' can also entail 'very reserved' and 'hard to engage'. However this group were not only nice but they were up for the activity. We started with some drumming rumbles and played a game called drum dominoes which is a bit like a drumming version of 'the mexican wave' except no one needs to get up off their chair - that was fantastic fun. Then we proceeded with teaching the class a really nice rhythm traditionally used for the West African village harvest time called 'Kassa'. When all of this was going wonderfully and one would imagine this was as good as it would get, it turned out that the group were also up for dancing too! 'What?' - you say - 'Year 9s - no!' Yes indeed! In the last ten minutes the students were taking turns in doing a mad 'echauffement' move (fast dance leading to the final drum call) which made the whole room come alive! When a great session like this happens first thing in the day, a fresh panic creeps in to us drumming facilitators - have the school given us the best students for the first session and are things due to go downhill from here?! Nothing of the sort. Each group were just brilliant in getting involved and embracing the group spirit of drumming - even the cheeky ones had a go at leading the group! But the real highlight must have been when a teacher came in to the class holding up a mobile phone. It turned out he was on the phone to a school 9000 miles away in South Africa and they were listening on the phone to the workshop. 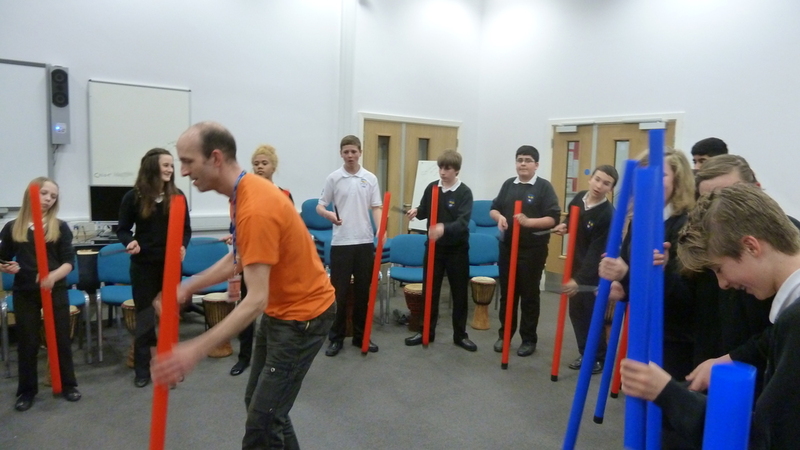 Well after 5 hours of African drumming you would think this music teacher would have had enough! But no, I could have sat and watched and listened all again! From the moment the first student walked in at 9am to the moment the last student walked out at 3pm there was nothing but smiles. The workshops were informative, challenging and highly interactive. Students got to play traditional instruments and some not so traditional ones. There was singing, dancing, drumming, listening and a phone call to South Africa, who also got the benefit of listening to the students partaking in some African drumming via telephone. The comment afterwards was that they couldn't believe British children could be that good! Well worth it and I would recommend 'Unbeatable Energy' to anybody who wants a good value, fit for purpose day! We would like to thank Priesthorpe School for inviting us to work with their pupils - what a great day!